Planning an outdoor wedding in Tennessee sounds like a wonderful idea, but the heat can sometimes reach a point that makes being outside uncomfortable. There are plenty of ways to keep everyone cool at a mid-summer ceremony so that you can still have your dream wedding among the outdoor scenic, Smoky Mountain charm of Country Jewell. Here are a few easy ideas to add to your wedding plans. Both small handheld fans and large electric fans can be placed strategically around the wedding so that your guests don't feel like they are melting in the heat of a Tennessee summer day. There are lots of kits available so that you can turn handheld fans into wedding programs, allowing them to serve two purposes at once plus add a very nice touch to the overall look of your wedding. Larger fans can be rented to keep a refreshing breeze blowing for all to enjoy. Just make sure that you place them so that the wind is not too strong on any one particular area. If a large part of your wedding will be held outdoors, you may want to add a pretty canopy off to the side so that it is easy for guests to find some shade nearby if they want to get out of the sun. You could also find some lovely parasols to pass out to guests so that they can shade themselves, and these are a unique option to have the bridesmaids carry instead of bouquets. Luckily, here at our rustic wedding venue near Knoxville, there are already plenty of spots to find some shade around the venue. Your reception will most likely take place inside our spacious wedding barn so your guests won't have to be out in the sun for too long. It is extremely important to keep everyone at your wedding hydrated on a hot day. Make sure that there is water readily available at all times. You could set up a table with beverage dispensers off to the side, and you could even offer fruit-infused varieties of water for guests to enjoy. Another idea is to have coolers filled with ice and water bottles, and you pitchers or carafes of water placed on each reception table is a nice touch too. As for the other beverages that you will be serving, having bottles or cans available for guests to grab from some type of cooler helps to avoid anyone having to wait in a long line for a drink. Some drinks could also be placed inside self-serve drink dispensers on the table next to the water. Frozen fruit or reusable ice cubes will keep the containers cold without watering down the drinks inside. This may sound strange, but the result is magical on a hot day! Fill a cooler full of ice water and then place washcloths inside of it. If you want to stay on-theme, use washcloths in your wedding colors. When anyone at your wedding feels overheated, they can place one of the washcloths on their neck and they will instantly feel refreshed. Your wedding party will especially appreciate this "cool" trick. 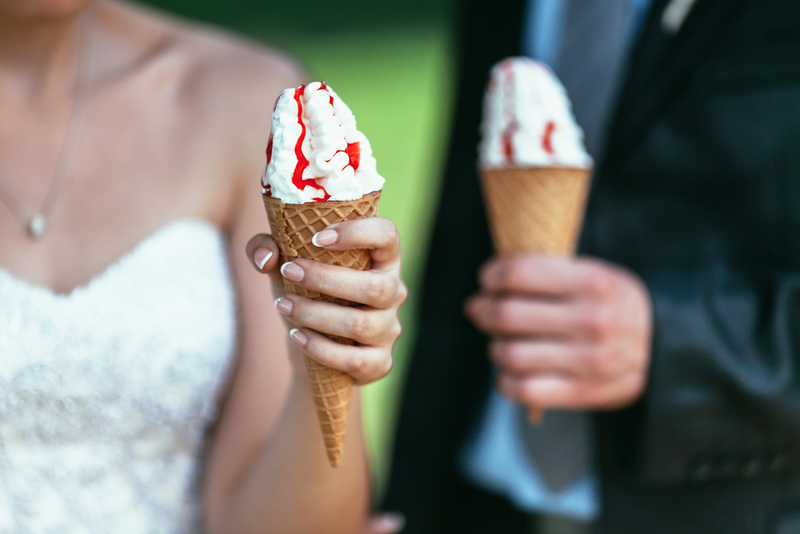 Last, but certainly not least, plan to serve a few ice-cold treats along with the wedding cake for dessert. Ice cream pairs deliciously with cake, and you could even add to the fun of eating it by setting out toppings and letting guests build their own sundaes. You know those popsicles that start as a liquid in a plastic tube that you place in the freezer to set? They are inexpensive and can be placed in buckets of ice for guests to easily grab. Another fun cold dessert is sno-cones. Machines can be rented to make the ice, and you could even offer adult versions from the bar. Our scenic outdoor wedding venue near Knoxville is a beautiful place to say "I do" and if you use some of the ideas above, tying the knot on a hot day won't be a problem for you or your guests. Plus, with the shady areas and indoor options available to you at Country Jewell in Heiskell, there are plenty of ways to get out of the sun when you need to. Come by soon and see the place for yourself. You're going to love it! Your ideas are easy and straight-forward to put in to any kind of wedding planning. Your whole guide on Outdoor Summer Wedding is operative for each and everyone. Planning an outdoor wedding is one of the toughest task for people having no experience. As a Miami wedding planner, i'll really act upon your ideas to make outdoor Miami wedding, outstanding.